TONi will be at the ESI show April 30-May 1st at the Metro Toronto Convention Centre. If you’ve never been to this exciting event drop your plans and come see what you’re missing!! There will be 500+ stands, over 175 companies, 65+ exhibitor classes and 7 featured speakers. Daniel Fricker (social media guru), Jayna Marie (professional makeup artist) & Lydia Gauthier (dermocosmetologist) just to name a few. New and trending products will be launched by different companies and some will provide free treatments. There are so many opportunities to learn and meet people in our industry. TONi will be at the Spavaro booth (#717) where attendees can use our free play station to test Gellen UV polish, hard gels, as well as Amore nail colours and glitters. We will also have teeth whitening services for $40 using the Smile FX system. Enjoy a whiter smile in just one treatment! If you’ve ever thought of becoming a nail technician or would like to take some of our esthetic courses we will be more than happy to discuss what our school has to offer! If you mention that you saw our Facebook post about the show you’ll receive a free sample of Toni Build and one of our new Gellen purple spongies! 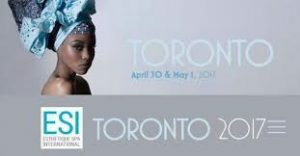 We are thrilled to be a part of the ESI show for 2017 and hope that you’ll stop by and say hi!